The HP 8656 and HP 8657 series of Synthesized Signal Generators are widely available on eBay, and will a little bit of luck and experience with eBay, they can be had for a fraction of the cost of a new radio, considerably below their original cost and still much below anything new of similar performance. Other Signal Generators are available, particularly the HP 8640A and B. These are not synthesized but are very clean. They are actually cleaner than most of the synthesized generators, and the 8640B, with the phase lock option, is as stable as a synthesizer. See the plots on John Miles' page. However, because they are mechanically intensive (particularly the frequency tuning mechanism, which uses plastic gears that tend to break) they tend to develop more mechanical problems as time goes by. Also, they are not programmable, a feature I was particularly interested in order to develop automated test programs. The HP 8656A is a Synthesized Signal Generator covering the band from 100 kHz to 990 MHz in 100 Hz steps. The output attenuator is adjustable from +10 dBm down to -127 dBm. It has AM and FM modulation capability with accurate modulation/deviation indicators. Modulation can be either internal, using a built-in generator at 400 Hz or 1 kHz, or an external source. One of the aggravating features of the HP 8656A is the fan, which runs all the time, unless the instrument is unplugged from the AC mains. The HP 8656A is fairly clean in the VHF band of 123.5 to 247 MHz (quite usable to check narrow band FM and SSB radios in the VHF band for instance), but the noise increases in the higher bands. The HF band (< 123.5 MHz), which is obtained by mixing down the highest band (494 to 990 MHz), has about the same noise and spurious modulation as the highest band. The HP 8656B is superior to the A model, with smaller step size (10 Hz instead of 100 Hz) and lower phase noise. Residual FM modulation is specified about half that of the HP 8656A. Otherwise, the instruments look the same and are comparable in features, frequency coverage (100 kHz to 990 MHz) and attenuator rating (+10 to -127 dBm). Both HP 8656 models do not have an RF ON/OFF selection, you turn RF off by setting the attenuator to max attenuation, not exactly the same thing but close enough for most applications. The HP 8657B is even more improved, with coverage to 2060 MHz, step size of 1 Hz all the way to 2060 MHz, an attenuator rated down to -143 dBm, and much better phase noise and residual FM specification. Also, the fan turns off when the instrument is in standby and it has an RF ON/OFF button (thanks for small favors). Please note that if you are contemplating buying an HP 8657B with rear panel output connector with the intention of moving the connector to the front, the conversion is not very easy. You will need to make a bracket to support the connector (the front panel is a thin sheet, not strong enough to support the N connector), and the wiring to the connector is semi-rigid cable formed to go around the many obstacles on its way to the front panel. The advantage of the bracket is that if the front connector is banged (like mine was) during shipment or other mishap, the front panel itself will probably be OK. I have no personal experience with the HP 8657A, but the spec differences with the B model are few (mainly the coverage goes to 2 GHz on the B model, and the A model has 10 Hz minimum step size.) The B model also has a pulse modulator option with pretty good performance, if you are into this sort of things. All 8656 and 8657 models have a similar construction which gives relatively good access to all boards and components. You will not need special extenders for test and troubleshooting. I also acquired an HP 3586 Selective Voltmeter, a very interesting instrument. 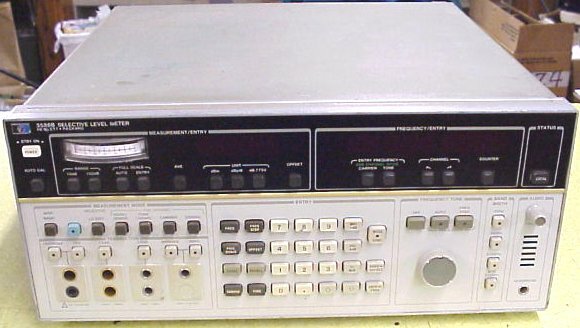 The HP 3586 was developed before spectrum analyzers became popular. It works like an HF receiver, with continuous coverage of the band from 200 Hz (yes, 200 Hertz) to 32 MHz. The A model I have has 3 selectable IF bandwidths: 20 Hz, 400 Hz and 3100 Hz (Option 003), and a tracking generator with a fixed 0 dBm output power level. 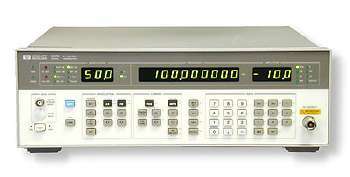 The HP 3586 is tunable in 0.1 Hz increments and has a counter feature. When fed a stable signal, pressing the counter button will display the frequency of the incoming signal with 0.1 Hz resolution. This is very handy to check the accuracy of the internal time base by setting the instrument to 5, 10 or 15 MHz and using the counter to display the frequency of the WWV signals. Since these signals are send exactly on the right frequency, it is easy to adjust the time base until it displays 5,000.000.0, 10.000,000,0 or 15.000,000,0 MHz. Other features that sets the HP 3586 apart from a *regular* HF receiver are the calibrated power meter, accurate to a dB or so from +20 dBm down to -120 dBm (a very good thing) and a quirky ALC (Automatic Level Control), (not such a good thing) which unlike the ALC on regular receivers, does not operate continuously, but by inserting variable attenuation in the amplifier chain in 5 dB increments. When listening to a signal with fading, the signal level jumps up and down in steps, which makes listening a little harder than on a regular HF receiver. The HP 3586 is widely used as a receiver primarily for experimentation on the low bands because of it's extreme stability and low phase noise. Unlike Ham receivers and transceivers, which generally have severely degraded performance below 1 MHz, the HP 3586 is fully specified down to 200 Hz carrier frequency !!! However, here I am interested in the tracking generator output. Since this output is derived from the same circuits generating the internal oscillators, it is remarkably stable and clean. All 3 signal generators are available with a high stability reference oscillator, usually an HP 10811 or equivalent. They also have inputs to use an external frequency standard if desired. For detail led specifications of these instruments, check my Manuals page. The picture below compares spurs from the HP 3586A (left), the HP 8657B (center) and the HP 8656A (right) at 30 MHz. For this picture, the instruments were set to 0 dBm and 1.5 kHz apart, around 30 MHz. The outputs were combined at the input of a Tek 494P spectrum analyzer. Note how the HP 3586A is the cleanest, the HP 8657B is doing a good job, with a little bit of AM noise, and the HP 8656A has significant AM and FM noise. Another difference between these instruments when used in an automated test setup, the HP 8656A is quite a bit slower when switched to a new frequency, even if the frequency change is very small. The HP 8656B is faster, and the HP 8657B is fastest. The frequency switching speed of the HP 3586 is not specified but seems quite fast, comparable to the HP 8657B.